Thank you Atlantic for this copy! This one was disturbingly normal. There is no danger, no suspense, just realisation that this is how it will go down. This woman is crazy. 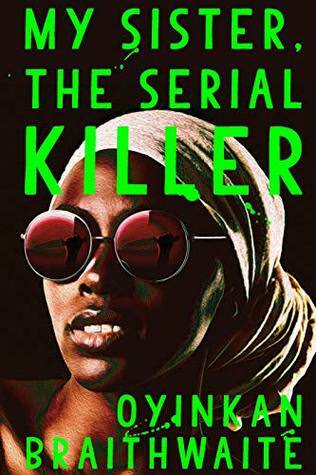 You can not know who might be a serial killer, Ayoola never shows signs of it, except when with her sister. Korede is the best sister in the world. She loves Ayoola, she wants her best, but sometimes family is not worth saving. But to Korede there is maybe not hope, just realisation and acceptance. And as a nurse she knows how to clean up after dead bodies. Not to mention her upbringing made her a clean freak. And she does see that her sister is not ok. How calm she is, how it is never her fault that she killed her boyfriends. She knows that there is a monster there. As for Ayoola, we are never in her mind. This is Korede's book. But Ayoola is beautiful, shallow, spoiled, and do not care for anyone. Except her sister then. Something is not right and she does not even seem to like killing. She just gets bored and does it. I had no idea how this would turn out and the ending, yes it fits. So disturbingly normal. Life goes on. This is messed up family dynamics. Great storytelling. I like how the author lets the novel speak for itself. You really have to read it to see it. Like any other normal book, about normal people, and cleaning up after murders. And in that way it feels really light and you will read it in a heartbeat. A kind, handsome doctor at the hospital where Korede works, is the bright spot in her life. She dreams of the day when he will realize they're perfect for each other. But one day Ayoola shows up to the hospital uninvited and he takes notice. When he asks Korede for Ayoola's phone number, she must reckon with what her sister has become and what she will do about it. Sharp as nails and full of deadpan wit, Oyinkan Braithwaite has written a deliciously deadly debut that's as fun as it is frightening. I'm surprised to say you say this is normal with a title like that. It's getting lots of buzz so I really want to read it. I really can not explain it. But it was just so normal! Wow! I've seen this making the rounds in talk, but didn't really know what it was about. Sounds interesting. Not my kind of read, but definitely interesting. Thanks. wow sounds really intense Blodeuedd. The title caught my attention and your review has me more curious than ever. It is quite the title! Sounds like an interesting story. The more reviews for this one the more I think about getting it. You're right - this was kind of disturbing in the normalization of the murders. I thought this was a great quick read. Sounds like a really odd book! Lol! Glad to hear you liked it. I've seen this one around a lot. Glad to hear your thoughts - I think I'd like it. Hmm, you describe the situation as pretty normal but reading your description of the story it also seems pretty crazy. I am curious how this dynamic will work! Yikes. It's even scarier when they act normal most of the time. Tough that its her sister. No big bling but sounds like it fits to the way life goes. She sounds crazy though. I have this one requested from the library. It sounds like something I should read. Sounds really good - even if I tend to avoid serial killer novels.